There are worse travel strategies than to visit places with evocative names. There’s Timbuktu, Congo and Okavango in Africa; and Salvador de Bahia, Darien and Patagonia in Latin America, names which purr with history and poetry. But Asia’s resonant place names beckon to me above all others. There’s Sumatra, Java and Borneo; Malacca, Vientiane, and Makassar; Kelantan, Kathmandu and Ayudhya. Not to mention the rivers: Ganges and Yangtze, Mahakam and Mekong. And the one I was headed towards: Ayeyarwaddy. My destination was Katha, a small town on the Ayeyarwaddy (Irrawaddy) which has achieved a modicum of recognition. It was here, between 1926 and 1927, that a British policemen named Eric Blair spent six months as one of 90 British police officers in Burma. Eric Blair, who subsequently took the pen name George Orwell, based his 1934 novel Burmese Days on a fictionalized version of Katha that he dubbed Kyauktada (which is derived from the name of a district in Rangoon). I started my journey by flying to the northern town of Myitkyina, then driving six hours to the river town of Bhamo where I boarded a “speedboat”, a 60-passenger vessel ten-meters wide and some 40 meters long, for the six-hour journey downriver to Katha. The arrival of the boat in Katha is one of the high points of the day for small traders, porters and trishaw drivers, who politely (this is Burma, after all, not Egypt) vie for the custom of arriving travelers. The river here is about a kilometer wide, placid, with exposed sandbanks that can hinder big boat traffic during the dry season. After clambering up the dirt river bank I was relieved to see that there wasn’t a taxi in sight. Just a couple of horse carts and a handful of trishaws – not the mechanized tuk-tuks of Bangkok but old fashioned man-pedaled three-wheelers, calmly waiting in front of a large Buddhist temple. There has been a mini-tourist boom in Katha in recent years, largely comprised of folks looking for Orwell. The Ayeyarwaddy Guest House, which seems to get most of the foreign visitors, receives about 200 travelers during the peak season, according to the owner, Soe Than Shwe. Reflecting this trend – or perhaps leading it, one never knows – the 2005 edition of the Lonely Planet guide, which in the edition of 2000 did not even mention Katha, currently devotes two pages to the town. Regardless of the politics of Burma, Katha is a delightful place to spend a few days and visit Orwell-sites. The tennis court features in Burmese Days as a place that most of the British characters avoided whenever possible — they were too enervated with heat and gin (“the cement of Empire”, Orwell writes) to undertake any exercise. Foreign visitors to Katha several years ago wrote about the disgraceful state of the court. Today the court has been renamed the River View Tennis Club, and it boasts an all-weather surface, a new net, and local players enthusiastically working on their backhands. About a hundred meters behind the River View Tennis Club, towards the river, but not on it (as the book’s fictional geography has it), sits the old English club, whose building and goings-on served as the model for the stubbornly all-white Kyauktada Club, the fictional focal point of Burmese Days. Indeed, so much of the book’s action takes place in and around the Kyauktada Club that the book could easily be transformed into a stage play, with the Club serving as the main set. On the afternoon I visited, in the lower part of the building, two part-time teachers were giving after-school tuition to young students. One teacher was writing a lesson in English verb tenses on the blackboard – “U Win [clean] his compound yesterday”, while a second teacher was putting her young charges through surprisingly complex algebra challenges. After class the English teacher introduced himself; U Pe Aung, whose day job is manager of the agricultural cooperative which now has ownership of the building. On the large main floor U Pe Aung gave me a tour. 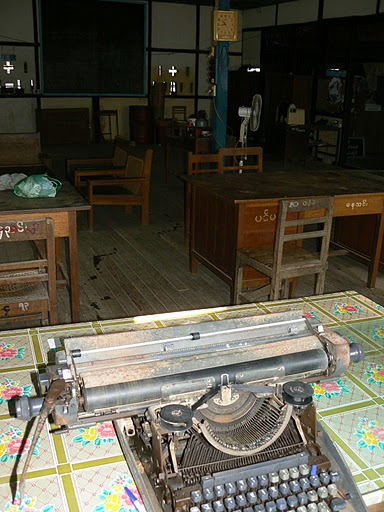 The teak floor is undoubtedly the same as decades past, but the walls have been stuccoed and whitewashed, and the tiled roof has been replaced by tin. On one of the seven empty desks stood an ancient Olympia typewriter, and on another rested a Gestetner 145, a stencil duplicating machine from the 1960s. “Yes, we get quite a few visitors,” U Pe Aung said. He estimates that some 4,000 tourists visit Katha during the period November – February, a number that sounds high, but which he says includes people who are cruising on one of the luxury live-aboard boats plying the Ayeyarwaddy which make a quick stop in the town-that-Orwell-made-famous. I can only sightsee for so long, and asked whether there was a golf course nearby. Soe Than Shwe, the owner of the Ayeyarwaddy Guest House, picked me up in a meticulously-maintained World War II-era Willys jeep, one of the few cars in town, and took me to Katha’s Ayar Shweli Golf Club. “Orwell didn’t play golf,” Shoe Than Shwe asserted, probably accurately, since the game is not mentioned in Orwell’s various Burmese writings based on his five years in the country. He added “Orwell didn’t like Burma,” a declaration shared by many of the relatively few Burmese who have actually read Burmese Days. Indeed, the book is cynical about virtually all of the virtue-challenged players. Larkin recounts the list of “repellent” characters: “Flory’s Burmese mistress is sluttish and desperate, his servant is obsequious, and a corrupt Burmese magistrate attempts to scheme and blackmail his way into the British-only club,” which is a key plot line in the novel. Orwell is, refreshingly, an equal-opportunity misanthrope. The British in Burmese Days are desperately lonely, borderline alcoholics, backbiting, racist prigs, who mouth platitudes about bringing civilization to the savages but whose real sentiment lies closer to that of one character who raves: “No natives in this Club! …we’ve ruined the Empire. This country’s only rotten with sedition because we’ve been too soft with them. The only possible policy is to treat ‘em like the dirt they are.” The unlovable British in the book are angry to be in Upper Burma, realizing that they were stuck in the humid backwater because they had no home left in England. Orwell’s fictional Kyauktada had a population of 4,000; today’s Katha has about 80,000. It seems a prosperous town, spread for several kilometers along the west bank of the river. Money comes in from trading in sugar cane, beans, peanuts and timber. The markets are full and animated, and dozens of shops, many of them charming wooden buildings, sell everything from homemade cowbells to brightly packaged Chinese rice cookers and DVD players. I would have enjoyed another day or two in Katha, but the ferry was leaving for another mellifluously-named town where Blair/Orwell lived – Mandalay, some 320 kilometers to the south.